All our visiting faculty members are highly experienced and are professionally engaged either as an academician or as a senior member in some corporation. IIPM has always believed that two of the most significant differentiating factors which make any institute stand out from the rest in the higher learning domain are its courseware and its faculty members. 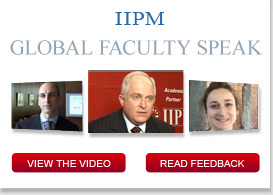 IIPM already has the most innovative, the widest and the most indepth research-driven course-content. But having a great course alone could never be a sufficient condition for an institute to be regarded the best, until and unless it has a pool of individuals, who are extremely passionate while teaching, committed to the well-being of the students and highly self-motivated to drive in the same kind of energy and passion in their students. Hence, IIPM takes extreme care while empanelling new faculty members, and hence, we have the most competent set of professionals on the job today. In addition to the great team of visiting faculty members, IIPM has an equally talented set of permanent faculty members. Most of these permanent faculty members are young and robust who bring in a high degree of energy and enthusiasm in the lectures they take. They join the institute as a research associate, engaged in various research and consulting activities in different functional domains. After spending around 2-3 years in research or consulting projects, they gradually get engaged in the institute as a lecturer in their areas of expertise. Additionally, as a part of our Global Outreach Programme (one of the most innovative academic programmes designed in India) IIPM ensures that every student gets an opportunity to be taught by the finest faculty members from the best universities in the world, of the likes of Stanford, Yale, Chicago, Wharton, Harvard, Columbia, LSE, Cambridge, Oxford, etc. Every month one such faculty member from these elite universities visits different IIPM campuses to conduct lectures in different functional areas. During their visit, these faculty members also interact with the respective academic deans at the IIPM campuses to discuss various means to incorporate latest research findings in the academic content of the specialized courses taught at IIPM.